Callaway revealed new GBB Epic and Epic Sub Zero fairway woods for 2017. The Epic fairways don't feature bars behind the face because it's too shallow. But they do feature a super-light crown that means weight can be moved to where it helps most. A triaxial carbon crown weighs just 5.8g, making it 78% lighter than a steel version. The saved weight is moved into key locations within the head to increase MOI (11% higher than XR 16 fairway woods) and lower the centre of gravity, making it easier to launch the ball off the deck. A fourth version of Callaway's Hyper Speed Face Cup flexes and releases more uniformly and efficiently at impact to increase ball speed across the face, especially towards the bottom. Like the driver there's also a Speed Step crown to aid aerodynamics. In true Callaway tradition there's a ton of loft options, from a strong 14° 3-wood to a 24° 9-wood. Weight saved by the ultra-light triaxial carbon crown is repositioned to increase forgiveness. The latest generation of Callaway's Hyper Speed Face Cup is more efficient at delivering faster ball speeds across the face. 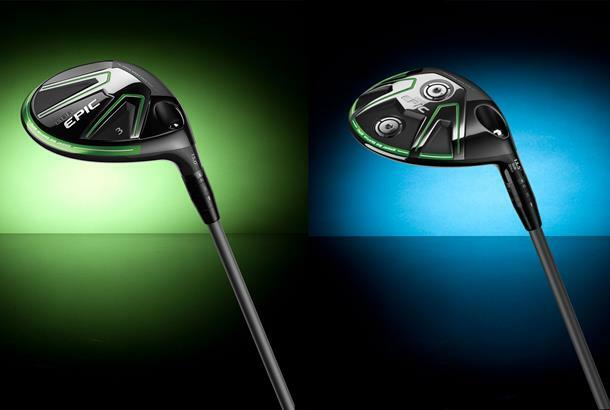 The Epic fairway comes in two versions, with a Sub Zero option joining the standard model. It has the same lightweight triaxial carbon crown, Hyper Speed Face and Speed Step aero features, but it also has adjustable weights in the sole to change the launch and spin rates by up to 400rpm. The heavier weight (22g) up front and the lighter weight (3g) in back equals low-spin, lower launch conditions for a flatter trajectory. Putting the heavy weight in the back delivers mid-level spin, a higher launch angle and raises MOI for easier launch.